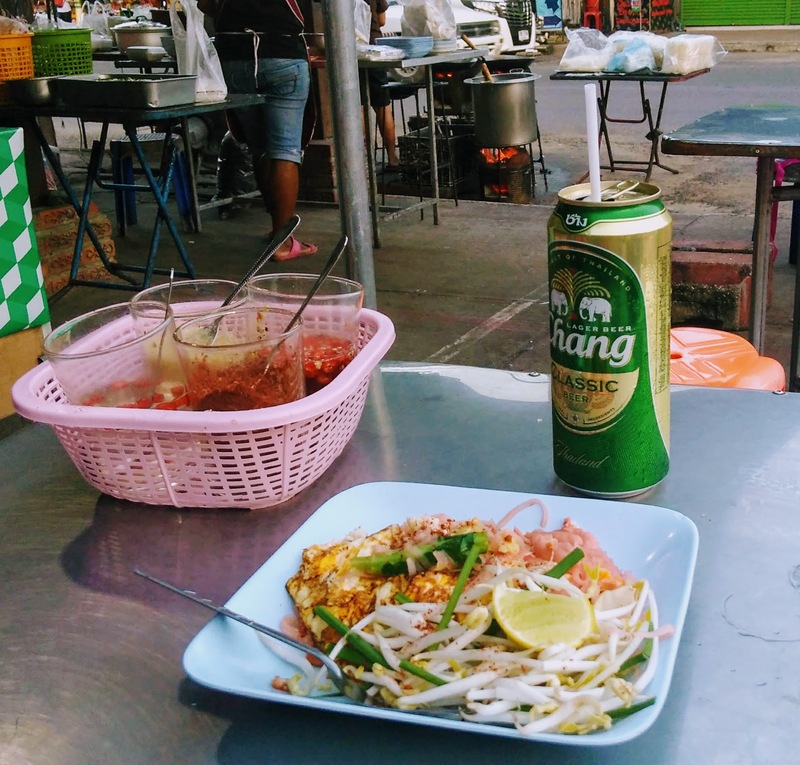 I met Alain while having Pad-Mii-Phimai, a local variation of Pad Thai, at a cooked food stall next to the stone walls of Phimai historical park. Alain noticed I was drinking beer through a straw. “Is that how you drink your beer back home?”, he joked. I quickly recognized his French accent and, in French, asked him why the hell he’d been served his noodles faster than me, even if I’d ordered before. “Oh, I just ordered in Thai” he said morosely. When we finished our meal, we moved to a pub on the other side of the street and settled for two pints of Tiger. Feel free to share, I offered. Another pint? Hell yes, it turned out to be complicated. Alain was in Phimai for a short overnight break from his month-long vacation in Thailand with his long-distance girlfriend, Nianny, who works in a barber shop in Nakhon Ratchasima, better known as Korat, and whom he’d met through a dating site a few years ago. Just look at her, he said, as he showed me photo after photo of his dream vacations with Nianny: spoilt in luxury resorts in the Maldives, swimming with turtles somewhere in Indonesia, drinking white whine in the French Valais, posing in front of snow clad Jungfrau, in the Bernese Alps. And, always, pretty Nianny looking speckless, always appropriately dressed yet never repeating a single dress or bathing suit. “This looks like a never-ending honeymoon!”, I praised. “I know… But wait….”, he said. More photos. Nianny was not only the perfect companion, she was also a devout temple-goer, a helpful daughter and….the mom of a teenage daughter. “Her daughter? But they look like sisters!” I said. Maybe it was the beer that was starting to make me feel tipsy, but there was something that didn’t add up in all this story. Why the hell were they not living together? Was it because of Alain’s kids? Nianny’s family commitments? The language barrier, perhaps? “But I feel that Nianny just wouldn’t fit back home”, he said, with an apologetic smile. “Worse – I feel that the spell would be broken. She’d just turn into…well, you know… another middle-aged Swiss woman expecting more and more from me and giving nothing back. “Let me put it this way”, said Alain, guessing my thoughts. Nianny makes me feel special in so many ways. Sometimes she’ll hand me a towel as I’m coming out of the shower. Or I’ll casually mention that I need this or that, and the following day she’ll have it ready for me: T-shirts, shampoo – you name it. Eventually we moved to Phimai’s night market, just a few steps away, for desert. He notice the quizzical expression on my face and continued. Who knows. I volunteered no answer. “I’m allergic to malls”, I said. I’m allergic to hospitals, but still go when I need to, he replied, categorically.